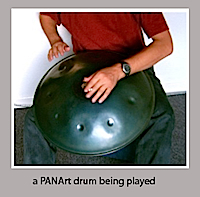 This piece was an improvisation with a unique instrument called a "Hang Drum," also called a PANArt Drum. 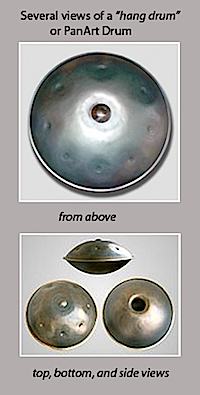 It has a similar sound to Caribbean steel drums. I am grateful to Kevin Roddy from Hawaii, who allowed me to record the foundation for this piece in the ten minutes before he had to pack up and get to the airport. other tracks over it, adding harp, strings, and also a counterpoint melody on flute. I find this piece hypnotic, and I can listen to it over and over again, like the way a mantra is repeated in meditation. My friends have said that even their road rage is calmed by listening to this piece. The rhythm used is in a time signature that has three beats to a measure (like a waltz) and produces a sound that is in continuous motion, much like the waves of the ocean. I named it "Song of the Siren" because I have always been fascinated by the idea of music so compelling that it draws the listener into it both deeply and intensely; such that all else is forgotten. Within the myth of the Sirens is the idea that this kind of beauty is also a bit dangerous to behold, and yet even more compelling because of the thrill of that danger, and the possibility that you would not want to escape, even if you could.